Sightings started out quickly this morning! Only a few miles east of Graves Lighthouse (outer Boston Harbor), we came across a distant, solo North Atlantic right whale. 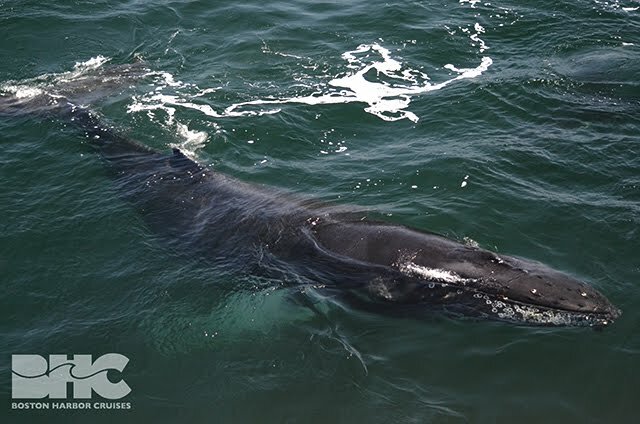 It’s not all that unusual to see “the urban whale” in such a heavily trafficked area, which is why vessel strikes is such a concern for this critically endangered species. 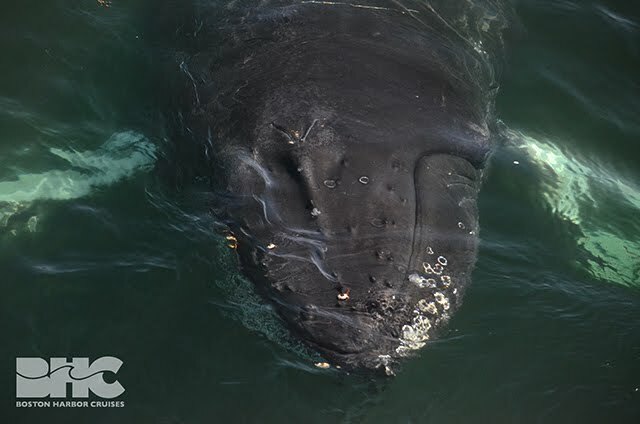 As required, we reported this right whale sighting to NOAA (866-755-6622) so that dynamic management areas for voluntary speed restrictions can be updated accordingly. A few miles east, we came across a group of six lazy humpback whales. Amongst these humps were Crisscross, Breeze, Striation, and a few juvies. 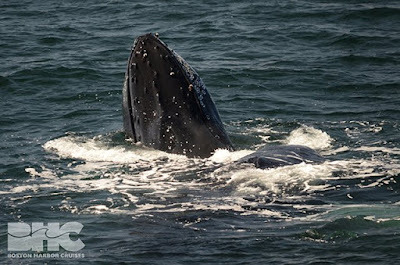 These humpbacks were very social as they rested at the surface exhibiting lots of rolling, head-to-head, and spy hopping behaviors (see photo). I couldn’t help but notice that one of the juveniles showed evidence of a (likely) recent encounter with humans. 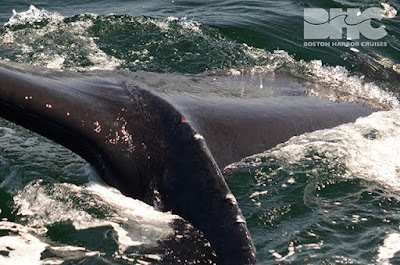 Highly consistent with entanglement wounds, fresh wounds were present around its tail stock from rope (see photo). If consistent with past years, approximately 30% of juveniles in the Gulf of Maine will acquire similar, and for many more severe, wounds from interactions with primarily lobster pots and gill nets. The group soon began to spread out as Striation, Breeze, and a third whale made there way east. Meanwhile, Crisscross and the two juvies, all of who were socializing with one another up until this point, decided to shift there attention on us. 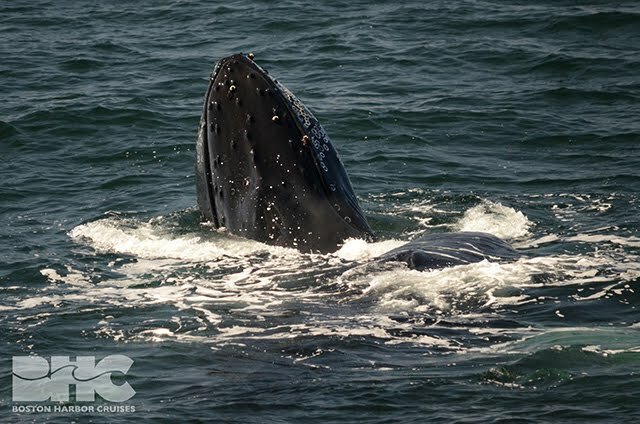 Over the next hour, these three whales curiously circled our boat and watched the passengers on deck as Captain Dave kept the vessel drifting out of gear. Over and over, this trio surfaced in a perfect row, positioned perpendicular to our beam while lifting their heads in and out of the water only a few feet off our port side (see photos). There was no denying that these gentle leviathans were looking up at, not the boat but, the passengers on board. Once in a blue moon, we have the opportunity to experience magical moments such as these where we can look into the eyes of these mysterious mammals and watch them looking back at us. These unusual encounters remind us that we are interconnected with these animals in both spirit and fate; we have a responsibility to protect them and the environment we mutually rely on for resources. You can protect our oceans using practical approaches such as buying locally, minimizing plastic use, and contributing to beach clean ups. If you live in Massachusetts, consider investing in a whale license plate! Proceeds from these plates go directly to disentanglement teams throughout Massachusetts and the Gulf of Maine. 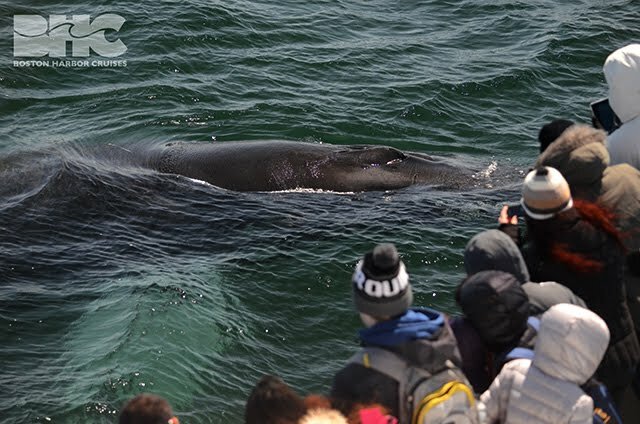 Come with us on a whale watch! Data collected on board is used to understand these beautiful animals, ultimately so we can better protect them!